I did the food swap hosted by Cat at The Verdant Life again this month. This time more non-bloggers participated, and I was assigned a non-blogger named Anne to send a box to. Since she lives more than 100 miles away from a Trader Joe’s I decided to send her a box full of my current favorite treats from TJs. I bought cookie butter, seaweed snacks, sea salt chocolate covered almonds and more. I forgot to take a picture though, so you will just have to imagine the goodness. I was sent a box by another non-blogger named Tiana. She sent me a box full of some goodies from Trader Joe’s as well, including the seaweed snacks I had sent to Anne, funny enough. 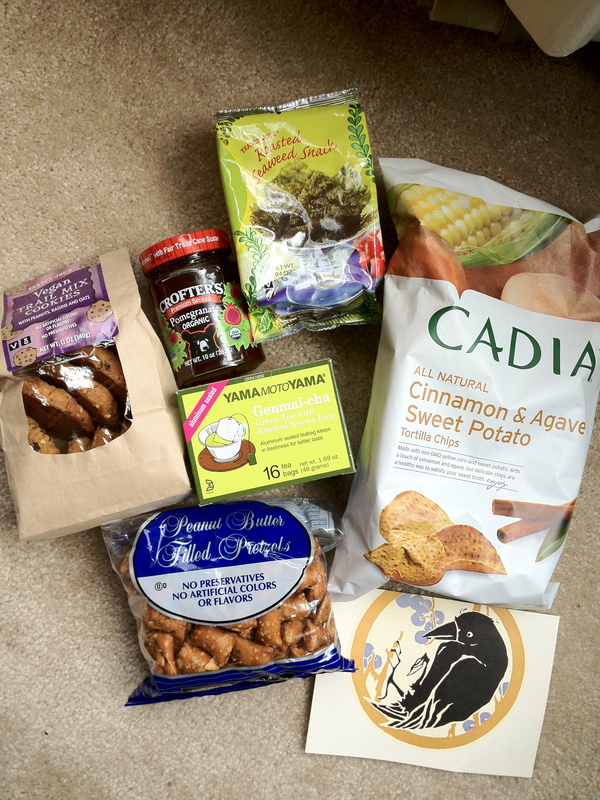 She included some vegan cookies from Trader Joe’s I had never seen before, some pomegranate jelly, the aforementioned seaweed snacks, a roasted brown rice green tea that sounds interesting, a bag of cinnamon and agave sweet potato tortilla chips that sound amazing. The last item was a bag of peanut butter filled pretzels that I opened about ten seconds after opening the package. They were the perfect snack to eat while watching world class athletes complete at the Olympics. If you want to participate in the swap next month sign up here, if you are in the United States. If you are in Canada, sign up here. If you are somewhere else in the world, start your own swap! Don’t worry if you aren’t a blogger, you can always guest post on Cat’s blog, or on the blog of the blogger you are paired with. Thanks Tiana, I love the treats! The genmai-cha is traditionally a sushi tea, but I’ve only had it at Richmond Sushi in Canada. Looks like a nice haul! I think I’ve snacked on those peanut butter filled pretzels. Yum! The pretzels are pretty addictive, as are just about any snack food from TJs!